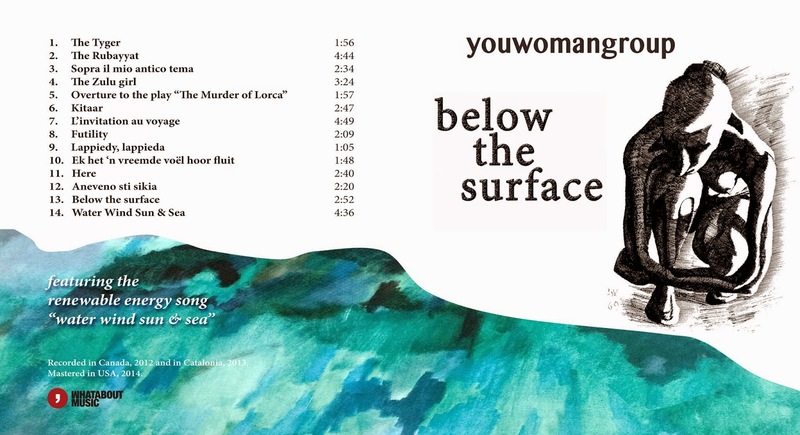 Two years in the making, first recordings of voice and guitar at One Ton Studios,Victoria, Canada, in July 2012, additional music added by the best musicians I know during 2012 and 2013 in the Emergency Room Studios, Barcelona Mixed at the same studios in Barcelona and mastered in the USA in 2014, finally "below the surface" was born, the new album of Gurdeep Stephens, Santi Careta and myself, with a lot of invited guests. Because our first album was called "you, woman" - see the other blog post below - we three now call ourselves the youwomangroup, with YouTube channel www.youtube.com/youwomangroup. I am a university professor, for the last 23 years at the Universitat Pompeu Fabra in Barcelona, working mostly in statistics in environmental and social sciences. I like combining my scientific and musical interests, especially during my travels. To view this blog optimally in Windows and listen to the music, you should use Firefox or preferably Google Chrome. Explorer may give problems!